The band's 14 On Fire tour will start in Abu Dhabi on February 21, 2014 and will move on to the Far East and Asia, including three shows in Tokyo and a one-off concert in Macau, according to the Daily Mirror. After that they'll move on to Perth, Adelaide, Sydney, Melbourne, Hanging Rock, Brisbane and Auckland, with two more dates in Asia expected to be announced soon. 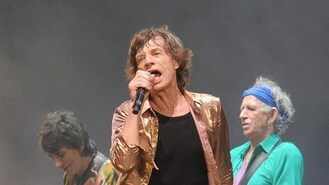 In a statement, Mick Jagger said: "Can't wait to be back on stage, especially in Abu Dhabi. I am really looking forward to playing all your favourite songs and seeing you all very soon." Keith Richards added: "The best place in the world for me is out on that stage. "Standby everyone... it's back to where we belong, me, Mick, Charlie and Ronnie and some friends all rocking out together. The wheels are in motion and we're on our way... see you very soon!" Mick Taylor, who was in The Rolling Stones between 1969 and 1974, is expected to join the tour as a special guest and the band will perform hits including Gimme Shelter, Paint It Black and Jumping Jack Flash, as well as some unexpected cover versions. Tickets go on sale on December 12, with an exclusive pre-sale from midday Monday to midday Wednesday (December 9-11).